we make world class wine right here at home. Awards are being won, nationally and internationally for our local juice. Winemakers and viticulturists are taking up residence, consulting here and spreading the word on our wealth of talent, terroir and the quality of our wine. On a recent trip to the Okanagan Valley I sat down with some key winery folks to discover what's new and who is making news in BC wine. One of British Columbia's most respected wineries has also become a key destination for wine tourism. The Quails' Gate tasting room and Old Vines Restaurant have continued to draw acclaim for design, food and beautiful vineyard vistas. 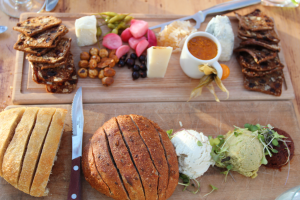 Built in 2007, the restaurant and tasting room have happily wined and dined hungry and thirsty visitors from around the world. The Stewart family, owners of Quails' Gate winery are celebrating their milestone 25 years in 2014 but they have been successfully growing vines since the 1950s, which means they know vines and vineyards. In addition, brother Ben Stewart introduced Dijon clone vines (from Burgundy, France) to Canadian soil, which is why Quails' Gate is home to some of the oldest Pinot Noir vines in the country. The vineyards are composed of hillside south-facing slopes around Mount Boucherie and the Quails' Gate estate vineyard as well as neighboring Sunnyside vineyard closer to the lake.The Martyna & Kildare vineyards, perfect for Riesling and Gewurztraminer are located in South East Kelowna and their famous old vines Foch comes from 1978 planted vines in Osoyoos. In total, they farm over 180 acres of vineyards. Grant Stanley, the winemaker who was instrumental in putting Quails' Gate wines firmly on the must-buy list moved on but has recently been replaced by former Mission Hill associate winemaker, Nikki Callaway. Callaway's experience in British Columbia, Bordeaux and South Africa should help Quails' Gate maintain their commitment to making great, highly sought after wine. 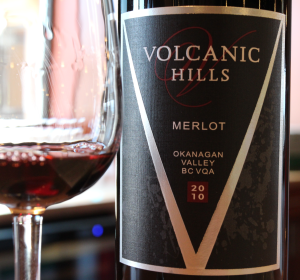 Not only was Volcanic Hills new to me, they are a fairly new winery to West Kelowna. Situated on the south-eastern slope of the dormant volcano, Mount Boucherie, Volcanic Hills is owned by the Gidda family (part of the same family that owns neighboring Mount Boucherie Estate Winery). The family immigrated from the Punjab and purchased their first Okanagan property in 1963. They began as fruit farmers and spread out into vineyards in 1978. Now with 80 acres of grapes, apples and cherries is also home to a new winery, built in 2010. The winemaking consultant, Daniel Bontorin is a well-known name in the Okanagan Valley. Bontorin has worked with Summerhill winemaker Eric Von Krosigk and at Tinhorn Creek, Hester Creek, Pentage, Domain Combret, Fairview Cellars, Hillside Estate, Quinta Ferriera, Le Vieux Pin, LaStella and in Northern Italy. The winery produces Chardonnay, Gewurztraminer, Pinot Gris, Merlot, Syrah, Pinot Noir, Gamay and Cabernet Sauvignon as well as some blends and rosé wines. The onsite patio restaurant, Lazeez, opened for the first time in May 2013 and serves a delicious looking and unique wine country lunch that includes butter chicken, samosas, dips and breads, kebobs, curried vegetable risotto and harissa prawn pasta. It is now closed for the winter but will reopen in May 2014. 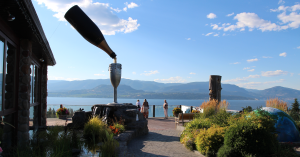 Behind the most photographed piece of winery art in the Okanagan Valley (a large wine flute being filled by a bottle of trademark Summerhill sparkling wine) there is a very serious group of people pioneering a new philosophy of winemaking. Okay, well it's not new, but it is new for many who know little of organic and biodynamic agriculture practices. Founder, Stephen Cipes moved to Kelowna from New York in the 1980s. 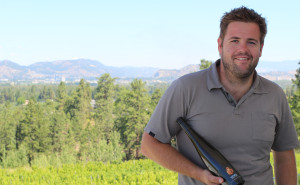 With dreams of making sparkling wine, he imported vines from France and planted them himself on the Summerhill estate just outside of Kelowna. Cipes continued to grow the brand alongside winemaker Eric von Krosigk, making a broad range of wines from organic estate vines and locally purchased grapes. 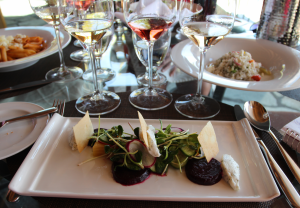 famous Summerhill Pyramid to sample wine and if they are lucky, stay and dine in the Sunset Organic Bistro. Cipes' sons, Ezra (CEO) and Gabe (Biodynamics and Permaculture) continue their father's legacy and are taking it to the next level. Understandably, it can be a bit daunting for people to grasp the concept of permaculture and biodynamic agriculture when it comes to simply choosing a bottle of wine - but to put it simply, these practices are better for the earth and most likely, you. I've visited biodynamic vineyards around the world and while some look at biodynamic practices in a very spiritual sense, others follow the path because at the end of the day they believe it creates healthier vineyards and therefore makes better wine. specialist in, but I love the workings of it. It involves some simple (and not so simple) methods of enriching the soil to benefit the plant, in non-invasive, chemical -free ways by using plants, cow pat, teas, moon and cosmic cycles to give balance to all living things. The man who developed these methods (and religion of sorts) was Dr. Rudolph Steiner, a German scientist and philosopher who believed a farm should be self-sustaining, self-contained and self-reliant. It promotes a strong ethical link to the guardianship of the land. Permaculture works in partnership with biodynamic agriculture, very simply put, to create sustainable and natural ecosystems and synergy within the vineyard. The Summerhill estate vineyard has been organic since 1986 but in 2012 was certified biodynamic by the internationally recognized Demeter. 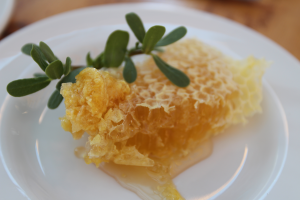 Right: Honey harvested by Gabe Cipes from one of the 47 colonies on the Summerhill property. Two new wines that showcase what Summerhill is trying to convey to the consumer (their practices and beliefs) through packaging, are the Alive Organic Wines, a red and a white are currently available. "We honor the fruit," says Ezra. "I think we're finding an audience and people are appreciating them [our wines] more." A dream of quality, not quantity, realized. I'm not sure it's entirely what John Skinner and his family anticipated when they began their journey into winemaking and winery ownership, but he has to be a very proud man these days. The stunning 60-acre estate looking down upon the glorious Skaha Lake in Penticton, British Columbia was planted with great care, international consultation and consideration for aspect in 2005, a year after Skinner purchased it. The site was previously a fruit orchard, which had lay fallow for nearly 20 years. It was malleable to contouring and the soils by then, were replenished. Skinner planted a few key varieties; Cabernet Sauvignon, Cabernet Franc, Syrah, Merlot, Petit Verdot, Malbec and Chardonnay seemed best suited. Long warm days followed by cool nights and breezes to keep the vines and fruit dry seem to favor the site and ultimately the wine. The well suited name, Painted Rock, refers to the ancient native pictographs still visible on the rock bluff behind the estate. 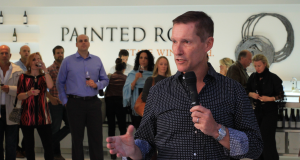 Painted Rock has since garnered notable awards in Canada and internationally and acclaim from top wine journalists. 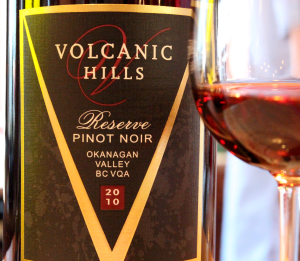 Most recently they were awarded InterVin International Wine Awards top Winery of the Year in British Columbia as well as gold medals for their 2010 Cabernet Sauvignon and 2010 Syrah. Painted Rock maintains the use of estate-only fruit and tops out at a mere 5000 cases annually. Meanwhile, the wines continue to evolve and improve - although how much more they can possibly improve, I'm unsure. in the Okanagan Valley) complete with a tasting room. The modern building and manicured lawns are the perfect setting for weddings and inspiring events. Like Painted Rock, Tantalus was born in 2004. It was then that Vancouver based corporate finance professional, Eric Savics, purchased an established vineyard above Kelowna. Savics and Skinner (Painted Rock proprietor) share very similar professional backgrounds, they both chose winery labels and names, which reflect the art and culture of western Canada's First Nations and they both wisely decided to stick with site specific varieties and the use of estate only fruit. Both have been extremely successful with their brands and the quality of their wines speaks volumes. The difference - while Skinner is the face of Painted Rock, Savics stays in the background letting his team step up to the plate. Having initially met Kiwi winemaker, David Paterson (Paterson was born in Vancouver but grew up in New Zealand) while judging wines at InterVin International Wine Awards in Niagara in 2012, I was pleased to spend some time with him at home in the Tantalus vineyard and catch up with the recent vintages. Tantalus holds the bragging rites to some rare old vine Riesling planted in 1978 and Pinot Noir (a Spatburgunder clone), planted in 1985. It's obvious that Paterson loves working with Riesling and Pinot Noir as well as Chardonnay and Pinot Meunier, the estate's other two varieties. He is also excited to be making sparkling wine, currently from Riesling, but going forward from the traditional varieties of Champagne - Pinot Noir, Pinot Meunier and Chardonnay. The 2012 Riesling is spot-on delicious with guava and exotic citrus, mineral and floral followed up by racy acidity on a crisp, dry palate $23. The 2010 Old Vines Riesling (current release) offers amazing lime zest, kumquats and mineral notes, which border on marmalade and petrol. The palate is nervy, it vibrates with acidity and is extremely focused $30. The 2011 Chardonnay has buttery, sliding gently into caramel notes with exotic spices and loads of citrus. It is fresh and lively with a lengthy finish $30. The Juveniles 'J' 2011 Pinot Noir offers rainforest floor atop juicy purple berries, leather and spice. It is silky and approachable, charming and fresh $23. Not far from Tantalus (as the crow flies) at the top portion of Spiers Road, just nine kilometers from Kelowna is a small and understated winery (at right) in its fourth vintage. 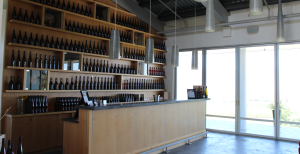 The winery was founded and then built in 2007 by two couples who had been school friends in Kelowna. The 20-acre estate was once an apple orchard and today is home to the winery, a tasting room and an aptly named Gentleman Farmer Vineyard, which contains Riesling, Chardonnay and Pinot Noir. 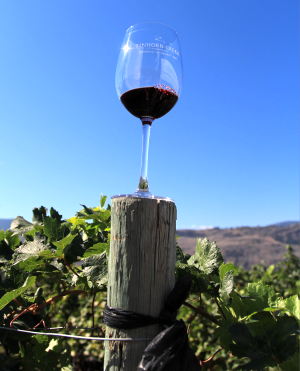 In addition, Spierhead Winery sources Cabernet Franc, Cabernet Sauvignon and Merlot from the Black Sage Bench from the South Okanagan Valley, in Oliver. Winemaker Bill Pierson recently took over from Tom DiBello (both formerly of CedarCreek) and we discussed the merits to proceeding with estate-only fruit in the coming years. That would mean no big reds but a wise focus on what they are growing in their own vineyard. The benefit to that is a focused portfolio of wines with a true sense of place and complete control over their nearly 7-acres (expansion is planned for 2014) of vines and grapes. Sadly, just two weeks after my visit this summer, the Gentleman Farmer Vineyard was hit by a nasty hail storm, which cost crop loss. 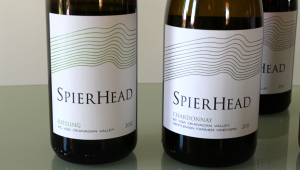 Spierhead has said they will be purchasing grapes for the 2013 vintage to cover the losses. Nature is sometimes cruel and weather certainly uncontrollable - I wish them the best of luck. 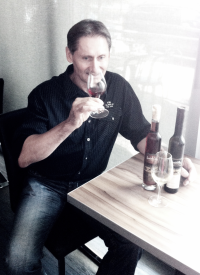 This year, Sandor Mayer celebrates 20 years of being winemaker for the more than 35-year-old Inniskillin Okanagan. 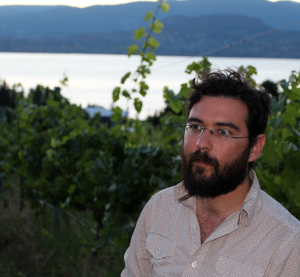 He is perhaps one of the most understated yet knowledgeable winemakers in the Okanagan. It may be because he is soft spoken and somewhat shy - after all, winemakers have only become the stars of the show in recent years and not all of them feel at ease in front of a large crowd, extolling the virtues of their skills. ►Read my article in Vines on the Cult of the Celebrity Vintner. Mayer (at right) visited Vancouver this summer for his first media lunch. We were a small group sharing a delicious meal at The Wine Bar (TWB) a great new addition to Provence Marinaside. 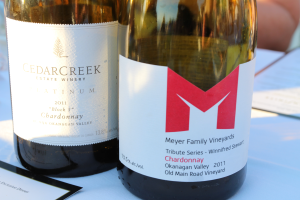 Mayer arrived in the Okanagan from Hungary in 1988 as a winemaker. 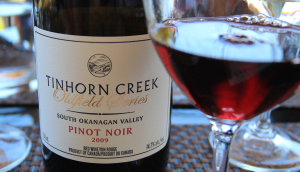 He was hired in 1990 to develop the highly regarded Dark Horse Vineyard in the South Okanagan and was asked to stay on. His first vintage as winemaker for Inniskillin was 1993. Since then he has watched the growth in the BC wine industry and the total amount of vineyard land expand incredibly. The key issue he sees is that most of the best vineyard sites were scooped up in the early years and these days newly planted vineyards tend to be on more marginal sites. These sites, although still able to produce good wine are a struggle in poor years whereas the prime vineyard land survives poor vintages much more successfully. He underlines that these best sites are not necessarily hillside or valley floor sites, but a combination with better exposition and better suited soils. Mayer himself has been fortunate to be able to "play" in the vineyards, experimenting with less common varieties such as Marsanne, Tempranillo, Roussanne, Malbec, Petit Verdot and Zinfandel - with very good success. The goal was to bottle wines made from obscure varieties not found (or found only in small amounts) in the valley. These small production wines were allocated to the Innsikiliin Discovery Series label, which is the second tier below the top-tier single vineyard Dark Horse Vineyard wines. You'll notice a slight change in the labels this year as well, from the entry level Estate Series and next level Reserve Series (which is going to be launched in 2014) right through to the Discovery Series and Dark Horse Vineyard at the top. These days, except in small wineries, the producer generally hires both winemaker and viticulturist who work together throughout the year. Mayer is both and that allows him to have very intimate knowledge of his vineyards, the vines and what they are (or are not) capable of. 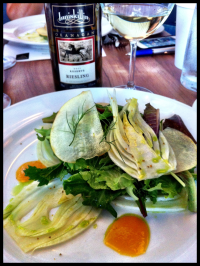 Mayer really wants to make a classic dry German style Riesling and he's on the right path. He made his first Inniskillin Riesling (table wine) under the Reserve Series from the 2011 vintage. It is vibrating with lemon drops, green apples, marmalade and stone fruits. The palate is concentrated and tangy with a lively finish. Paired beautifully with a fennel and apple salad. The Discovery Series Tempranillo 2011 offers cherries, strawberries and leather with dried rose petals. It is supple and smooth on the palate with great acidity and spiced coca on the finish $30. Paired with a delicious wild mushroom ravioli. The 2009 Discovery Series Zinfandel $26 leads with wild briary fruit, chocolate and espresso, smoked meat and sweet spices. Generous fruit on a smooth palate is layered with salted licorice, mocha and spicy fruit. 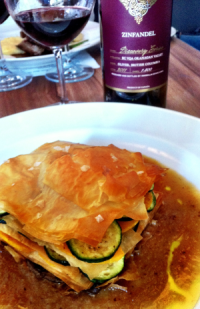 At right, paired with a grilled vegetable and phyllo stack. The not-yet-released 2011 is masculine and slightly rustic (reminiscent of a Primitivo) with dark fruit, leather, baking spices and a smoky and savoury palate. The always surprising Tempranillo Icewine 2012 offers fresh cranberry and strawberry aromas and flavours - it is sweet but not cloying with wonderful length and concentration that truly shows the variety well. The 2012 Riesling Icewine was gorgeous with vanilla ice cream and offered apricot and peach jam in honey with chamomile tea, candied lemon peel and kumquats. Beautiful weight, concentration and length. 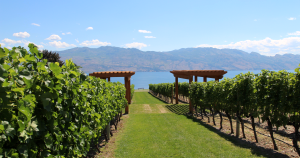 The eastern bench of Lake Okanagan, just outside of Kelowna, is home to one of Canada's most recognized and awarded wineries - CedarCreek Estate Winery. Founded just over 25 years ago, in 1987 by Senator Ross Fitzpatrick, it is now run in the capable hands of his son, Gordon. 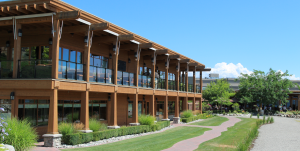 It is a lovely site to visit, the Terrace Restaurant serves wine country cuisine during the day (currently closed for the season until spring 2014) and out front, the manicured lawns of the Rose Garden and Pavillion have been the site of weddings, large functions and concerts. 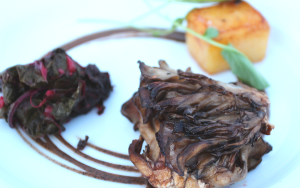 I visited CedarCreek for an incredible sunset dinner this summer, prepared by the extremely tanlented Chef David Hawksworth of Hawksworth Restaurant in Vancouver. It was one of a summer series of Visa Infinite dinners and hosted an outstanding selection of British Columbia's best wines. 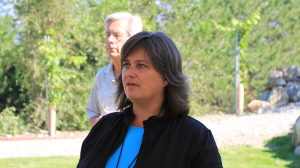 The last time I visited Tinhorn Creek Vineyards, winemaker, President and CEO Sandra Oldfield, viticulturist Andrew Moon and the team were a week shy of beginning the 2013 harvest. It was a gorgeous, sunny Okanagan day and we visited the Diamondback Vineyard on the Black Sage Bench where sweet and plump Cabernet Franc and Merlot were ripening very nicely. An amazing 100-acres of drip irrigation had finally been completed in the Diamondback. The task took five years and was the bulk of the new drip irrigation system Tinhorn has invested heavily in. The largest of their two vineyards, Diamondback is (100 of the 130 acres owned by Tinhorn Creek) where they grow the later ripening varieties of Cabernet Sauvignon, Cabernet Franc and Merlot. Malbec and Syrah have been added more recently and they have secured suitable spots for Pinot Gris, Pinot Noir and Chardonnay as well as a newer addition of Semillon. Known for longer and warmer days as well as nutrient poor, deep and quick draining soils, the Black Sage Bench is perhaps the most highly prized vineyard land in the Okanagan Valley. 30 acres of the 50-acre site. This east-facing site has given us some delicious Kerner, Gewurztraminer, Pinot Gris and Muscat. Early morning sun and a higher elevation are a deterrent to frost. The cooler nights and shorter late day sun lends these grapes lively acidity and freshness. In addition, Tinhorn Creek has some Merlot, Syrah, Petit Verdot, Sauvignon Blanc and Viognier planted here. This vintage marks former Santa Rosa, California native, Sandra Oldfield's twentieth in the Okanagan Valley. Our gain is Sonoma Valley's loss - she's one of the most dynamic yet down-to-earth people you'll meet. She loves challenges and taking on new tasks. 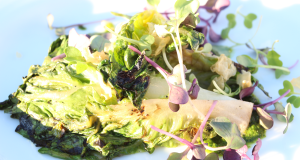 Sustainability continues to challenge Oldfield on multiple levels, from food waste at the on-site Miradoro Restaurant to the sustainability and safety of their employees. Oldfield takes it in stride and gobbles up information and advice wherever she goes and from whomever she speaks to. 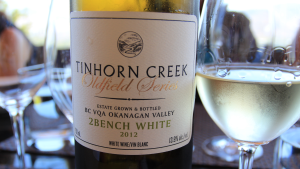 ►I wrote about Tinhorn Creek and their commitment to sustainability in 2012 here. 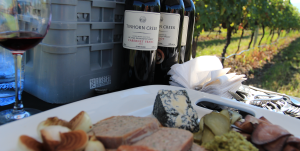 The Tinhorn Creek wines have matured. They have confidence, consistency and charm. Most of all they have personality. A personality, which reflects not only Sandra Oldfield and chairman Ken Oldfield but viticulturist Andrew Moon, assistant winemaker Korol Kuklo and vice-president Sean Everest but all those involved with the winery restaurant, Miradoro, as well. Miradoro Restaurant at Tinhorn Creek has been a huge success - not only with wine tourists but with the ever-important locals and neighboring winery owners. 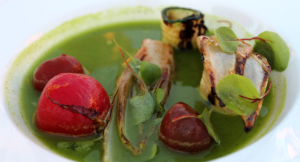 That success is thanks to partner and experienced restaurateur Manuel (Manny) Ferriera and Chef Jeff Van Geest who continues to create stunning dishes that pair extremely well with Tinhorn's wines.